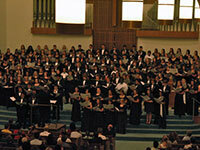 Join us for the Stetson University Choral Festival featuring a select high school choir performing S.A.T.B., T.T.B.B. and S.S.A. repertoire. Given the overwhelming positive feedback from participating directors from last year's festival, we are excited to continue providing this opportunity for your best singers. Led by Sandra Peter, D.M.A., Stetson University's interim director of choral activities, Andrew Larson, D.M.A., associate director of choral activities, and Timothy Peter, D.M.A, this exceptional two-day festival focuses on healthy singing, spirited rehearsals and outstanding performances as we develop the joy of singing through musical excellence. Additionally, there will be opportunities for the most accomplished singers to have a private vocal coaching session with a Stetson University voice faculty member. Finally, there will also be a Director's Chorus rehearsal and performance. Music packets will be mailed upon registration, and festival participants should prepare the notes prior to the festival. Student preparation will ensure a transforming musical experience for all involved. Registration is available online. The deadline to register for the festival is Monday, October 1, 2018. The cost per singer is $30, which includes registration, music, folder and pizza party. Music packets will be sent out after registration has been completed. Each school may register up to four balanced quartets. For additional questions, please contact Sandra Peter, D.M.A., at speter@stetson.edu.